see, you don't even have to comment! Today is my birthday. Do you want to wish me a happy birthday? I'm 35. nothing big going on today, just going to work like always. Happy Birthday! Have a great day, no matter the number. this is great!! Happpy birthday!! Have a fabulous day! Happy birthday. I found this while looking for images of lemurs eating cakes, because it was my friend's birthday on Sunday and she went to Madagascar once. 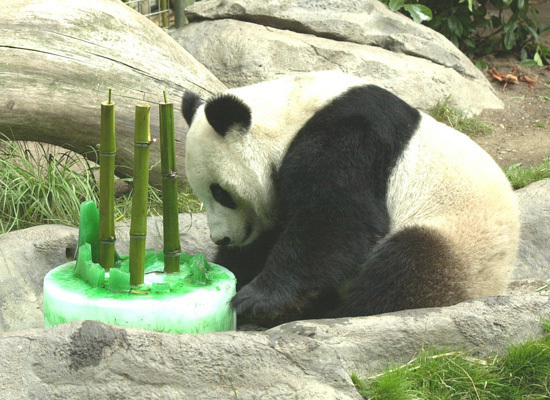 I'm not sure what pandas and lemurs have in common, aside from being mammals, but the candles are bamboo, so it's awesome. I've felt tempted to do this on several birthdays, but never quite felt capable of doing it! What? No all of the above? Happy 7 minutes late (EST) Birthday! 35 is a good number! I guess I shouldn't have voted yes, since yesterday I didn't want to, but I did today when I read this post. Happy belated, though!